Almost everything. Great apartment, friendly and helpful staff, and perfect location. The perfect home away from home! Centrally located, with everything you could want, including washer and dryer, dishwasher, hairdryer, etc. Tastefully decorated with nice details throughout. Comfortable bed and good shower. Good wifi as well. Such a great solution when our remodel went over schedule! Comfortable and thoughtfully appointed. The washer and dryer were very much appreciated! Super close to everything we wanted to see. Internet was good, bathroom was huge. Great location, couldn’t get more convenient.This apartment has everything one could need. Staff were great. FAB, as in really really good, spledid appartment, all comfort. in heart old town Maasstricht. The staff were really wonderful. We had to change rooms for the last evening (my booking error, not theirs!) and they transferred everything for us. Even put things into the fridge and found a beautiful vase for the flowers. The location was also absolutely perfect. Close to the university, restaurants and the local grocery store (Albert Hein) to stock our room. This, along with the well stocked kitchen, made cooking a breeze. Our rooms had beautiful big windows and views that we found delightful: one over a square with shops and second over typically Dutch rooftops. Definitely will return when in Maastricht again. Loved the central location, the helpfulness of the staff, the convenience of top quality appliances including washer and dryer. The overall available space in the maisonette was outstanding. Wifi was good and reliable. The location was fantastic and the apartment was beautiful and fully equipped with kitchen utensils. The staff was also very friendly and helpful. Lock in a great price for Urban Residences Maastricht – rated 9.3 by recent guests! 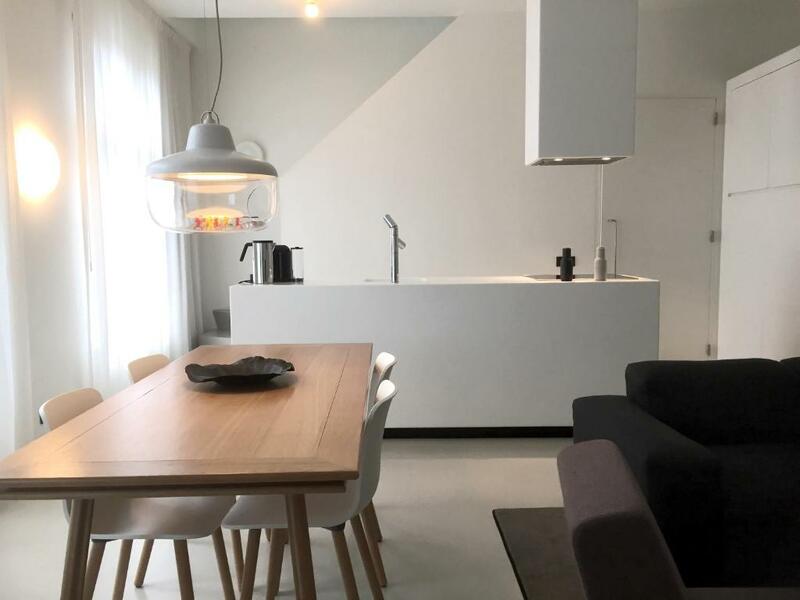 Urban Residences Maastricht This rating is a reflection of how the property compares to the industry standard when it comes to price, facilities and services available. It's based on a self-evaluation by the property. Use this rating to help choose your stay! One of our top picks in Maastricht.Located in the heart of Maastricht on the Vrijthof Square, Urban Residences Apartments offer spacious 1-bedroom apartments with Alessi design. All the maisonettes are located on two levels, the suites are located on one level. Each of the units can be reached by stairs only. The penthouse has ceiling-to-floor glass windows and features a terrace. 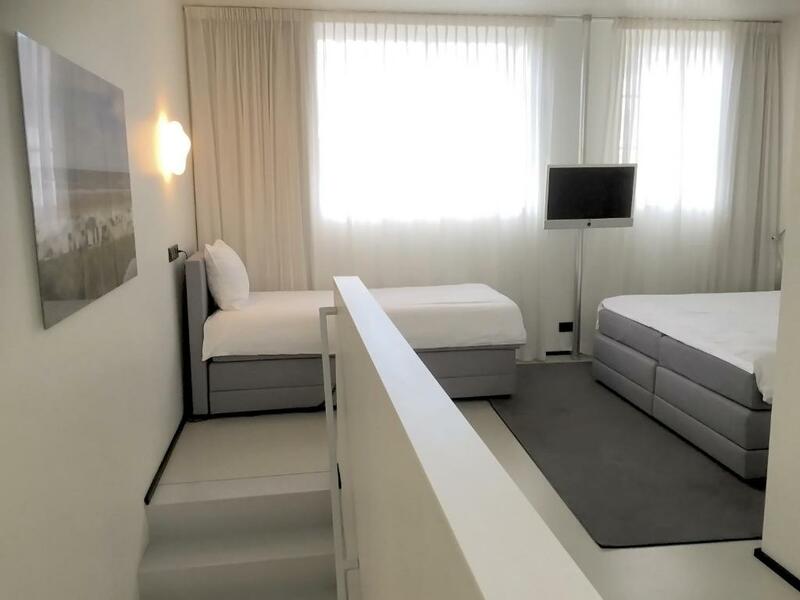 All the maisonettes and suites are equipped with appliances such as a washing and drying machine, dishwasher and flat screen plasma televisions for your convenience. Wifi is free. There is a large variety of cafes and restaurants in the direct surroundings of Urban Residences. On the Vrijthof are located the St. Servatius Basilica, Maastricht Theater, St. Jans Church and Vrijthof Museum. Maastricht University is located at a 5-minute walk. Lively Markt is 4 minutes by foot. From there you have direct links by bus throughout Maastricht. 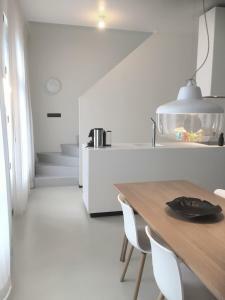 뀐 Located in the real heart of Maastricht, this property has an excellent location score of 9.7! When would you like to stay at Urban Residences Maastricht? The Maisonettes are located on the backside of the building, on the first floor. All maisonettes are split level and have stairs to reach the upper level. They all feature a living room with an open design kitchen. All rooms are completely furnished and come with luxury design furniture and brand appliances. Maximum occupancy is 2 adults + 1 child under 6 years (see Extra Bed Rates). This 2-floor apartment is located on the highest level of the building and includes a living room with open design kitchen on the 1st floor. The 2nd floor includes a large bedroom and luxurious bathroom. The apartment is completely furnished and comes with luxury design furniture, brand appliances and free WiFi. Please note that this accommodations is not suitable for people with reduced mobility. This 1-floor penthouse features a living room with an open design kitchen, bedroom and a luxurious bathroom and comes with luxury design furniture and brand appliances. The facade of the penthouse is made of glass which creates a spacious atmosphere. It also features a terrace of 32m2 with a garden lounge set. Please note that the room rate is based on 2 guests. Maximum occupancy is 2 adults. This apartment cannot accommodate a baby cot. This 2-floor apartment is located on the highest level of the building and includes a living room with open design kitchen on the 1st floor. 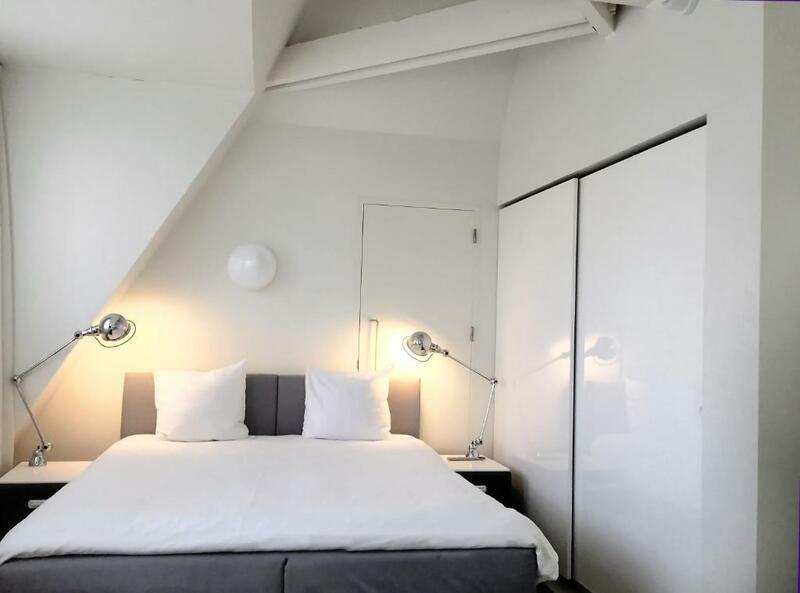 The 2nd floor includes a large bedroom with a large double and single bed and a modern bathroom with toilet. On request the bed configuration can be changed into 3 separate single beds. 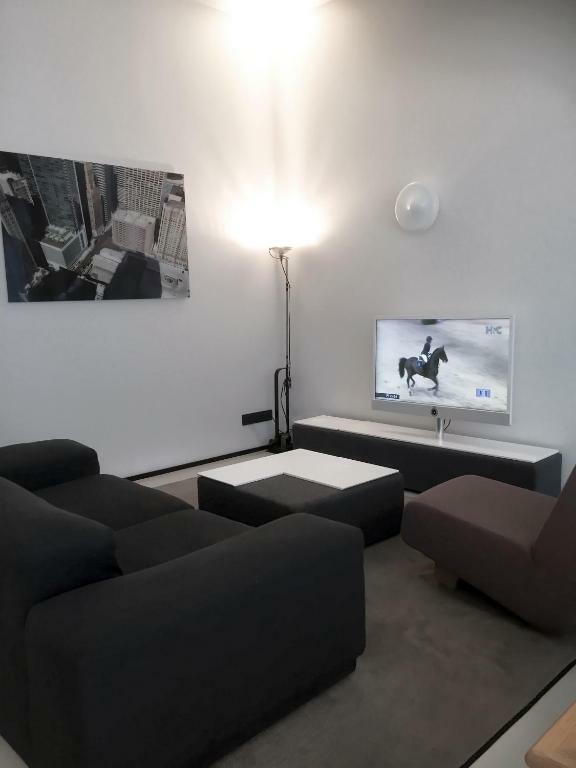 The Maisonette is completely furnished and comes with luxury design furniture, brand appliances and free WiFi. Maximum occupancy is 3 adults + 1 child under 6 years (see Extra Bed Policy). This split-level 1-bedroom accommodations is located on the back side of the building on the first floor. It offers a living area with an open-plan kitchen and Nespresso coffee maker. 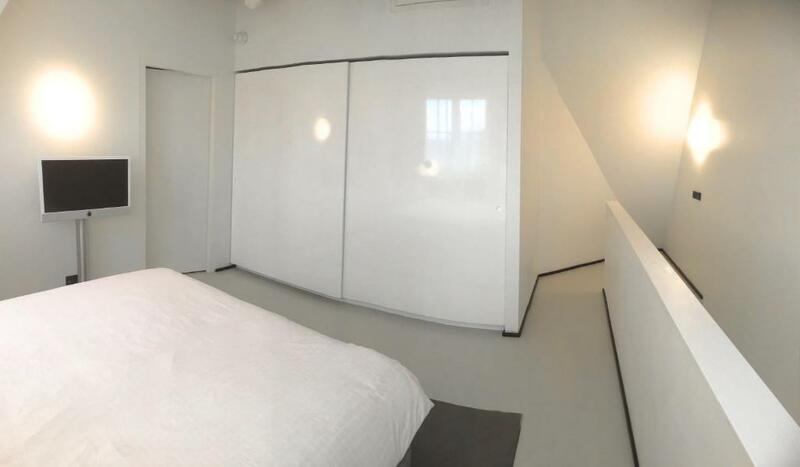 The bedroom offers a double and single bed, which can also be set up as 3 single beds. The Maisonette for 3 people is fully-furnished with design furniture and brand appliances and it includes free WiFi. There is a private bathroom with a shower and double washstand. Please note that the room rate is based on 3 guests. This Family Suite is located on the back side of the building on the lowest level. This is just below entrance level. It offers a large living area featuring 2 sofas, of which 1 can be used as a double bed (4.6 ft x 6.6 ft). There is a large open-plan kitchen with Nespresso coffee maker. The sleeping area is separated by curtains and offers a double bed, which can also be set up as 2 single beds (on request for a surcharge). The family suite is fully-furnished with design furniture and brand appliances and it includes free WiFi. There is a private bathroom with a shower and washstand. Please note that the room rate is based on 4 guests. Maximum occupancy is 4 adults + 1 child under 6 years (see Extra Bed Policy). This Family Suite XL is located on the back side of the building on the lowest level. This is just below entrance level. It offers a large living area featuring 2 sofas, of which 1 can be used as a double bed (4.6 ft x 6.6 ft). There is a large open-plan kitchen with Nespresso coffee maker. The sleeping area offers a double bed, which can also be set up as 2 single beds (on request for a surcharge). A third single bed is placed in a separate part of the bedroom. This Family Suite XL is fully-furnished with design furniture and brand appliances and it includes free WiFi. There is a private bathroom with a shower and double washstand. Please note that the room rate is based on 5 guests. Maximum occupancy is 5 adults + 1 child under 6 years (see Extra Bed Policy). The suite is located on the first floor and features deluxe design and brand appliances throughout. The bed area is separated from the living area by curtains. 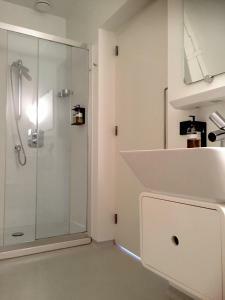 The shower and wash stand is in the sleeping area, there is a separate toilet. Please note that the room rate is based on 2 guests. Maximum occupancy is 2 adults + 1 child under 6 years (see Extra Bed Policy). This split-level 1-bedroom accommodations is located on the front side of the building on the first and second floor. It offers a large living area with an open-plan kitchen and a sofa bed (double bed 4.6 ft x 6.6 ft). Please note that the room rate is based on 4 guests. Please note that this accommodations is not suitable for people with reduced mobility. Maximum occupancy is 4 adults + 1 child under 6 years (see Extra Bed Policy). This split-level 1-bedroom accommodations is located on the front side of the building on the first and second floor. It offers a large living area with an open-plan kitchen and a sofa bed (double bed 4.6 ft x 6.6 ft). The bedroom upstairs offers a double and single bed, which can also be set up as 3 single beds (on request). The private bathroom offers a shower and washstand. This family maisonette XL is fully-furnished with design furniture and brand appliances and it includes free WiFi. Please note that the room rate is based on 5 guests. Please note that this accommodations is not suitable for people with reduced mobility. Maximum occupancy is 5 adults + 1 child under 6 years (see Extra Bed Policy). Area Info – This neighborhood is a great choice for travelers interested in gourmet food, cafes and food – Check location Excellent location – show map Guests loved walking around the neighborhood! 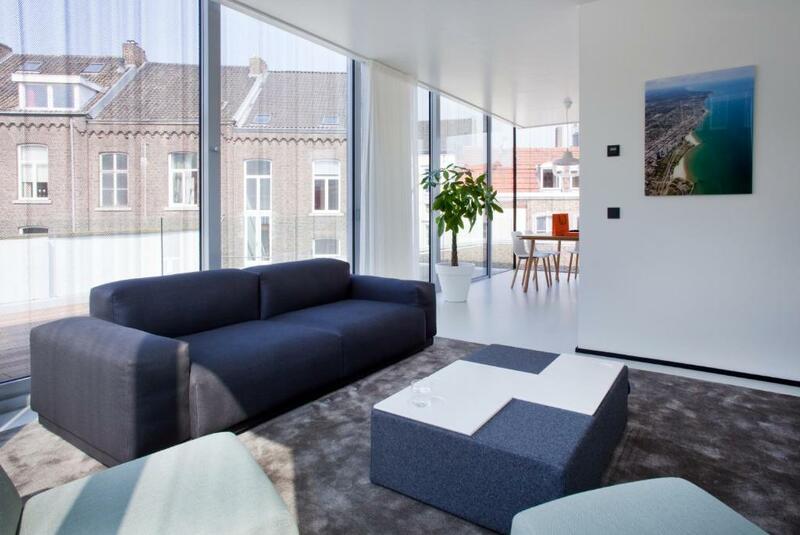 House Rules Urban Residences Maastricht takes special requests – add in the next step! ATM card Debit card Urban Residences Maastricht accepts these cards and reserves the right to temporarily hold an amount prior to arrival. Urban Residences Maastricht accepts these cards and reserves the right to temporarily hold an amount prior to arrival. Please note that Urban Residence Maastricht has many stairs and steps which makes it difficult to move around for guests with disabilities. There is no elevator available. Please note that the total price of the reservation, including the city tax, will be charged on the day of booking (see Policies). This will be refunded when the booking is canceled, provided that the reservation was made for a refundable rate and 7 or more days prior to arrival. We love it here and will come back again! There is no lift so accessibility could be an issue and this automatically means some guests cannot stay here. It was easy enough to do the stairs with a baby however. Brilliant location in the heart of Maastricht, easy to check in and everything you needed was in the flat. Very clean and neat, and light with big windows. Parking at 27 eur a day at the parallel road, but parking is expensive in the Netherlands all round. Very central and still very quite. Beds super confortable. Kitchen mega modern and clean. Everthing top-top-top! We were at the Urban Residences in Maastricht for 5 days due to a very sad circumstance. We cannot praise enough the whole stuff for their kindness, their help and their competence. Heartfelt thanks! The bed and the pillows could have been a bit more comfortable. Unfortunately no breakfast available, but it was not a problem. There are many cafes in town where you can have breakfast. Excellent location, the room was very clean and with a lot of space. It was advertised to have parking, but that was actually in a garage down the road. 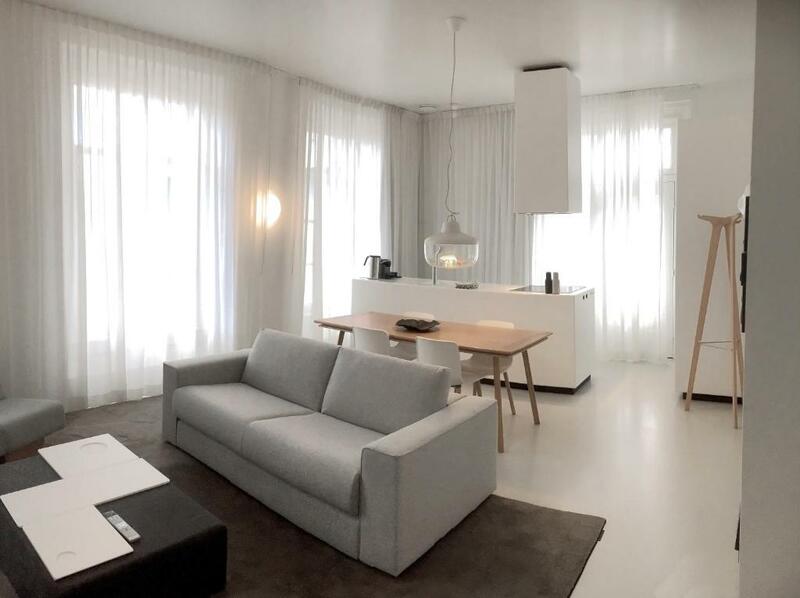 The designer minimalistic Alessi interiors Location in the city center yet peaceful! Totally extra, but it would have been nice to have a high chair for the toddler. We ended up bringing our own baby bed as there is only one available (so be sure to ask in advance if you need it). No elevators but perhaps due to the preservation rules. The atmosphere of the room. The prompt politeness of the staff. Location.